Kerala beaches are amongst the best in India and are an excellent alternative to Goa. Some of the beaches remain relatively deserted. Yet, in case you don't want to relax, you'll find plenty going on at others. This Kerala beach guide will point you in the right direction of the most suitable beach for you. The best time to visit weather-wise is from December to March. However, you'll get some fantastic off-season discounts (often 50%) during the monsoon. If you want action, you'll definitely find it at Kovalam beach -- the most popular and most developed beach in Kerala. 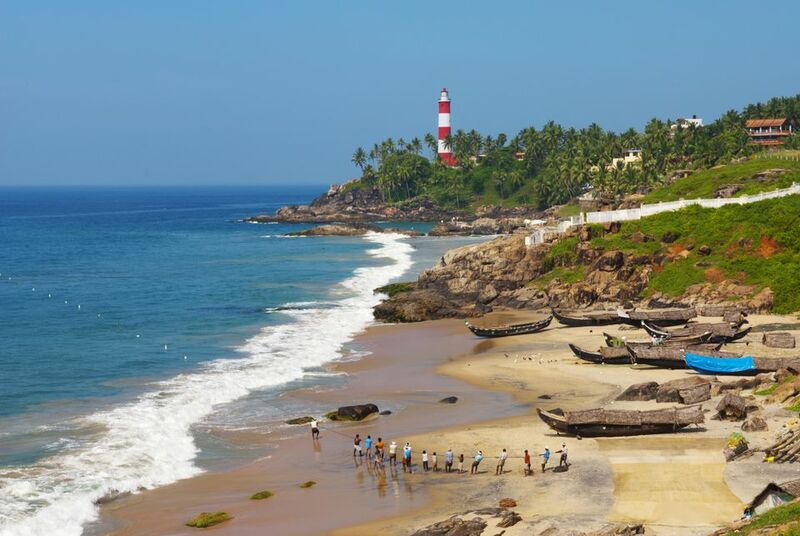 Often likened to Goa's Calangute and Baga beaches, Kovalam is located not far from the capital, Trivandrum. It's actually made up of two main coves -- Hawa (also referred to as Eve's beach) and Lighthouse. Lighthouse is the biggest and busiest of the two, with its promenade lined with open-air restaurants. Kovalam is a popular surfing destination in India. If you'd prefer somewhere a little more secluded, you'll find nearby Samudra beach to be a better option. Quiet Marari beach is located not far from Alleppey, making it convenient for those who'd like to spend some time at the beach in between going on a houseboat trip along the backwaters. A big attraction here is the earth-conscious Marari Beach Resort. It's set on a sprawling property filled with coconut groves and lotus ponds, and among other things offers Ayurveda treatments and yoga classes on the beach. Off the beaten track in India, the small town of Kannur, in northern Kerala, is known for its secluded beaches, mysterious masked spirit-possession theyyam rituals, and handloom weaving. The theyyam season runs from October until May and Kerala Tourism has a comprehensive calendar of theyyam events. There are some delightful, laid back (and inexpensive) beach houses in the Thottada beach area, such as Kannur Beach House, Waves Beach Resort, Chera Rock Beach House, KK Heritage Homestay, and Seashell Beach Home. Kannur district is also home to Muzhappilangad Drive-In Beach. You can drive all the way along its extensive stretch of sand. Bekal beach, in far north Kerala (around one hour's drive from Mangalore airport in Karnataka) is famous for its old fort -- apparently the largest one in Kerala. The beaches are clean and unspoiled, but luxury hotels have already started moving into the area, making it the place for a pampered getaway. The most popular resort is the gorgeous Taj Vivanta. It's possible to stay there for under 9,000 rupees per night, depending on the season. The secluded Lalit Resort and Spa Bekal is located on a private beach with backwaters running through it. However, it's pricey. Room rates are from around 19,000 rupees per night. The 10 kilometers long Cherai beach makes an appealing side trip from Kochi. It's located on Vypeen Island, which can be reached from Kochi by ferry and then a bus or auto rickshaw ride through the villages and paddy fields -- yes, it is isolated. A substantial portion of the main beach was recently beautified, which included the addition of a new walkway. One of the remarkable sights there is beach and lagoon so close together. If you explore some of the surrounding lanes, you'll get great views! Stay at Les 3 Elephants, a peaceful backwaters eco-resort.